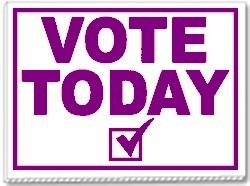 Put your purple checkmark by the purple person today! 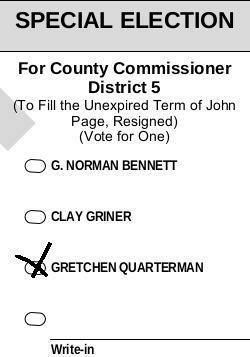 Please vote for Gretchen Quarterman for Lowndes County Commission District 5 in the Special Election today. And don’t forget to vote for School Board and judges: those are all decided today, too. Plus it’s Primary Day for all the other races. This entry was posted in PR and tagged Election, Georgia, Gretchen Quarterman, Gretchen Quarterman for Lowndes County Commission, gretchenforlowndes, Hahira, Lowndes County, PR, Special Election on May 20, 2014 by John S. Quarterman. 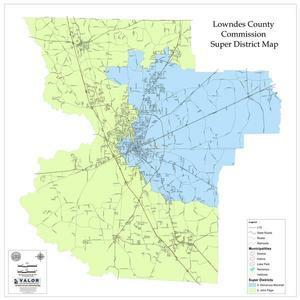 Today is Election Day for Lowndes County Commission District 5. Remember, it’s not November: this is a Special Election, to be decided today, the winner to take office immediately upon certification of the results. Don’t forget to vote, and please call your friends and neighbors and ask them to get out and vote for Gretchen today! You can find your polling place in My Voter Page by the Georgia Secretary of State. Just a reminder — The election that I am in will be decided tomorrow May 20th. It is not a primary. It is a special election. Please vote tomorrow at your local precinct. Thank you to those who have early voted. 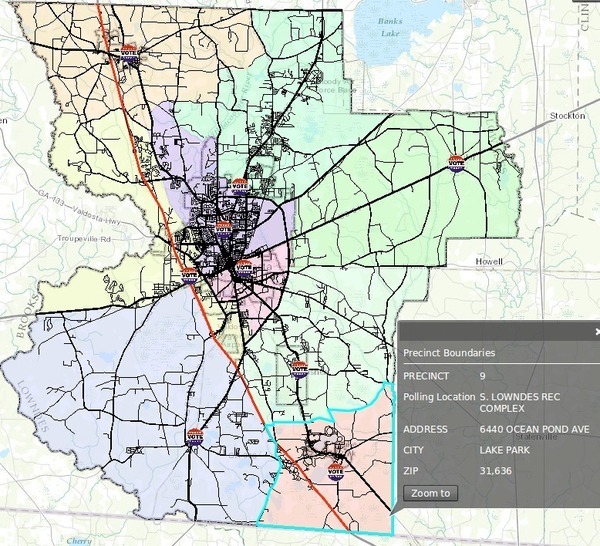 This entry was posted in PR and tagged 2014-05-20, Clyattville, Dasher, Georgia, Gretchen Quarterman, Gretchen Quarterman for Lowndes County Commission, gretchenforlowndes, Hahira, Lake Park, Lowndes County, PR, Remerton, Special Election, Valdosta on May 19, 2014 by Gretchen Quarterman. 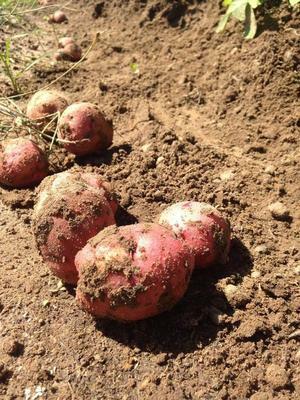 Come see Gretchen and the buried treasure from paradise: potatoes dug up yesterday at Okra Paradise Farms, available this morning at Downtown Valdosta Farm Days, 9AM to 1PM, at the historic Lowndes County Courthouse. 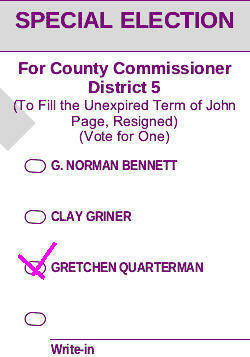 And don’t forget to vote Tuesday for Gretchen for Lowndes County Commission District 5. May 20th is the last day for this Special Election. You can find your polling place online at My Voter Page by GA Sec. State. If we all vote, she will win. This entry was posted in Opportunity, Stewardship and tagged Agriculture, District 5, Georgia, Gretchen Quarterman, Gretchen Quarterman for Lowndes County Commission, gretchenforlowndes, Hahira, John S. Quarterman, Lowndes County, Lowndes County Commission, Okra Paradise Farms, opportunity, Potatoes, Special Election, stewardship, Valdosta, Valdosta Farm Days on May 17, 2014 by John S. Quarterman. “People would have a lot more confidence in the government if they understood it and they could see it happen,” said Gretchen Quarterman yesterday morning on drive-time radio. She used Monday night’s Brookhaven apartment building rezoning public hearing in Lake Park to illustrate: local landowners have property rights and there was a lack of communication between the developers of a proposed apartment building, the Lake Park city government, and the neighbors. She also talked about jobs, including in local agriculture. For example, she ran the 2014 South Georgia Growing Local Conference. Money spent on local agriculture supports the local economy, not companies far away. This entry was posted in Opportunity, PR, Stewardship, Transparency and tagged 105.9, Agriculture, Brookhaven, Chris Beckham, District 5, Economy, Elections, FM, Georgia, Government, Gretchen Quarterman, LAKE, Lake Park, Lowndes Area Knowledge Exchange, Lowndes County, Lowndes County Commission, radio, Special Election, transparency, Valdosta, WVGA, ZBOA on April 30, 2014 by John S. Quarterman. Where do you vote? Are you registered? 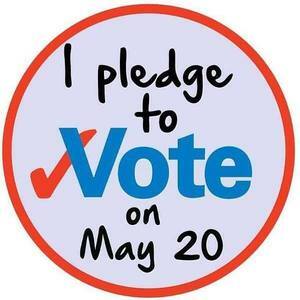 What’s on your ballot for the Special Election and Primary Election May 20, 2014? All these questions are answered online at My Voter Page (MVP) by the Georgia Secretary of State. Please vote for Gretchen Quarterman. All three ballots also include the election for school board, which is very important: the school board gets more of your tax dollars than anything else in the county, and educates your or your neighbor’s children. 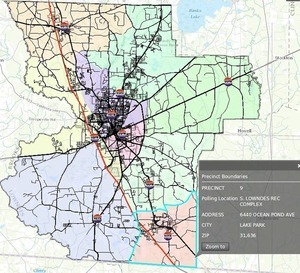 This entry was posted in PR and tagged ballot, Democratic, Georgia, Georgia Secretary of State, Gretchen Quarterman, Gretchen Quarterman for Lowndes County Commission, gretchenforlowndes, Hahira, Lowndes County, MVP, My Voter Page, nonpartisan, PR, Republican, Special Election on April 24, 2014 by John S. Quarterman.